HamiltonBuhl HA2 Headphones - Headsets Direct, Inc. 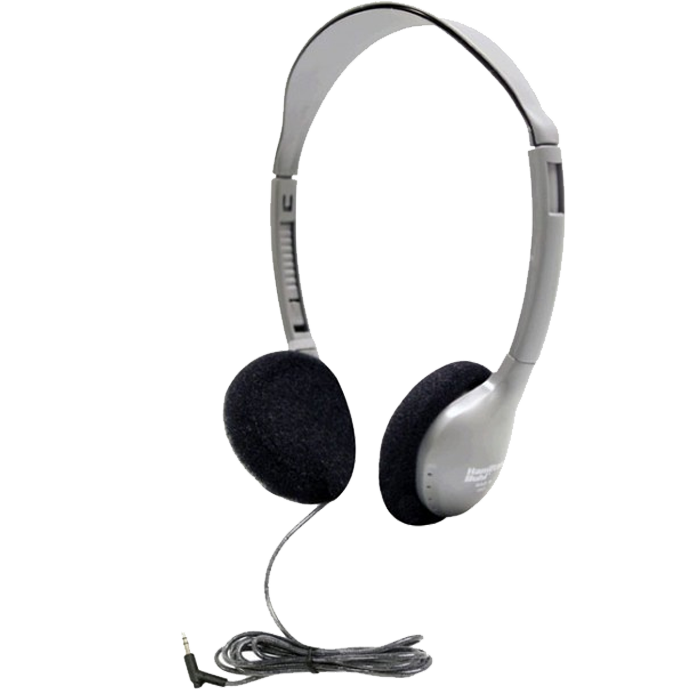 The HamiltonBuhl HA2 stereo headphone is a wonderful headphone for any school classroom or computer lab. The HA2 headphone is a headband over the head with speakers on both ears. The headband is adjustable, and the speakers rotate. The ear cups are soft, foam cushions that are replaceable. This is a very comfortable headphone. This wearing style is considered on ear, and on ear simply means it rests up against your ear. This works well in an average-to-quiet environment. When you compare it to the headphones that go around your ear, those are made for the average-to-louder environment. The HA2 is a good budget-friendly headphone. The Hamilton Buhl HA2 does not have a microphone, so this is for listening only, and there is no speaker volume control in the cable. You will need to change the volume within your device or PC. That helps to keep the cost down, making it a very budget-friendly, but good all-purpose headphone. The cable is a 5-foot DuraCord. This is a unique cable that HamiltonBuhl HA2 uses on many of their headphones. It’s chew-resistant, kink-resistant, and it’s a braided cord in a PVC sleeve, so very durable, but yet very flexible. This headphone terminates in 3.5 single plug, so you want to make sure that the device that you’re plugging into is compatible with the single 3.5 audio plug. The HamiltonBuhl HA2 headphone also comes with a storage bag. You can write students’ names on it to keep things more organized. The bag also acts as an anti-lice bag. Once you seal it up, in 24 to 48 hours, it will kill any lice that are on the headphones. If you have questions on the HamiltonBuhl HA2 headphone or any other models, please give us a call at Headsets Direct-800-914-7996, or visit us on-line at www.headsetsdirect.com.